1. Zack Andrusiak, Everett Silvertips: Everett Silvertips forward Zack Andrusiak recorded the sixth hat trick of his WHL career and the first with his new club in a 9-1 win for the Silvertips against the Lethbridge Hurricanes. Andrusiak scored the second, third, and sixth goals of the game for Everett, adding a primary assist on the team’s seventh goal. The Armstrong, B.C. product now has 49 points (34G-15A) in 45 games this season between the Silvertips and Seattle Thunderbirds. Overall, he has 134 points (76G-58A) in 184 WHL regular season games. 2. 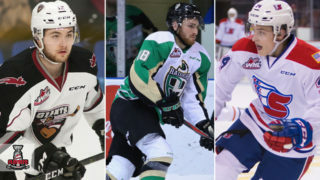 Noah Gregor, Prince Albert Raiders: San Jose Sharks prospect Noah Gregor of the Prince Albert Raiders recorded the first hat trick of his WHL career Saturday in a 7-3 win against the Kootenay ICE. Gregor scored the third, fifth, and sixth goals of the game for the Raiders, scoring the team’s insurance goal as a short-handed marker. The Beaumont, Alta. product now has 63 points (30G-33A) in 44 games this season and 268 points (116G-152A) in 238 WHL regular season games. 3. Beck Warm, Tri-City Americans: Beck Warm continued his solid play of late, stopping 47 of 48 shots Saturday in a 3-1 win against the Spokane Chiefs. Warm stopped 18 of 19 shots in the first period, then stopped all 29 shots over the final 40 minutes as his team battled back for the win. The Whistler, B.C. product has a 23-17-2-0 record, 2.85 goals-against-average, 0.916 save percentage, and one shutout in 42 games with the Americans this season. In 88 WHL regular season games, Warm has a career record of 42-34-3-1, 3.24 GAA, 0.903 SV%, and two shutouts. Brandon Wheat Kings captain Stelio Mattheos (Carolina Hurricanes) scored the shootout-clinching goal Saturday, leading his team to a 3-2 win against the Regina Pats Saturday as the two teams split a home-and-home set. Kyle Walker and Connor Gutenberg traded goals in the first period. In the second, the Wheat Kings’ took the lead on Cole Reinhardt’s 15th of the season, but Walker responded with his second of the game 16:35 into the third to send the game off to overtime. After some well-placed chances by both sides, things boiled down to a shootout, where Ben McCartney and Mattheos both scored while Ethan Kruger turned aside both shooters from Regina. In addition to his shootout-winning goal, Mattheos had a pair of assists. Reinhardt added an assist for the multi-point game. Both goaltenders delighted for their respective teams as Kruger stopped 31 of 33 in regulation and overtime. Dean McNabb had 26 saves on 28 shots in the narrow loss. Despite being behind for the majority of the game, the Swift Current Broncos battled back fiercely in the third period and overtime against the Saskatoon Blades to win 5-4. In the first, the Blades took control of the game with Gary Haden and Dawson Davidson scoring, but the Broncos were able to cut the lead with a goal from captain Tanner Nagel. Tying the game in the second period, Ethan O’Rourke went five-hole on the Blades’ goaltender. However, the tie was short-lived with Saskatoon’s Eric Florchuk (Washington Capitals) and Cyle McNabb scoring two more goals before the end of the second. With two spectacular bounce-back shifts for the Broncos, Nagel and Owen Blocker were able to tie the contest again and move the game into overtime. When the Blades took a tripping penalty, it gave Swift Current an extra attacker on the ice where Joona Kiviniemi was able to score the overtime winner. Capping off their East and Central Division road trip on a positive note, the Moose Jaw Warriors played a solid game against the Medicine Hat Tigers, winning 3-1. Striking first for the Warriors, Justin Almeida (Pittsburgh Penguins) found a way to get it out from underneath the Tigers’ goaltender. 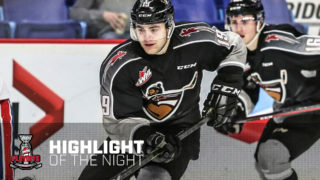 WHL rookie leading goal-scorer and 2019 NHL Draft prospect Brayden Tracey also put one up for Moose Jaw, grabbing his 19th goal of the season. In the third period, Baxter Anderson scored his second goal of the weekend and third of the season with a beauty shot from the point to put Medicine Hat on the board. However, in the final minute of the game, Almeida was able to sink the puck into the Tigers’ empty net to finalize the Warriors win 3-1. Earning his 14th win of the season and stopping 26 shots, Brodan Salmond earned the win. 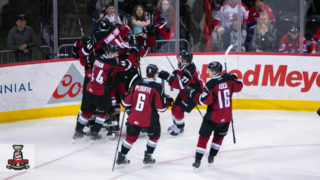 Two goals from Brandon Hagel (Chicago Blackhawks) and a three-point night from Cameron Hausinger propelled the Red Deer Rebels to a 5-1 win over the Prince George Cougars. Both teams traded goals in the first as Arshdeep Bains and Cougars captain Josh Curtis found the back of the net. In the second half of the second period, Hagel and Hausinger both scored to give Red Deer a two-goal advantage after 40 minutes. In the third, Hagel’s second of the game and a goal from Brett Davis (Dallas Stars) came with a minute of each other to put the game to bed. 2019 NHL Draft prospect Ethan Anders was on his game, stopping 26 of 27 shots. Four different Rebels, captain Reese Johnson, Dawson Barteaux (Dallas Stars), Chris Douglas, and Alex Morozoff, each picked up a single assist in the win. 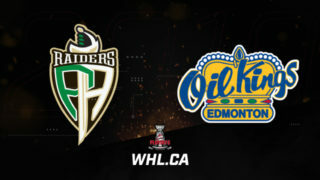 Rebounding from just their sixth loss of the season, the Prince Albert Raiders resumed their typical dominance and skill over the Kootenay ICE, winning 7-3 Saturday. 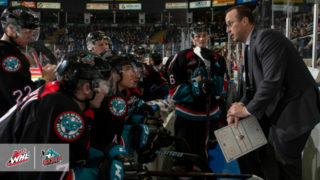 Prince Albert’s Dante Hannoun, Parker Kelly (Ottawa Senators), Noah Gregor (San Jose Sharks), and Spencer Moe capitalized multiple times on Kootenay. Kelly finished the night with four points (1G-3A), while Gregor recorded the first hat trick of his WHL career. Hannoun and Moe each finished with three points, with Hannoun scoring twice and Moe scoring once. Providing Kootenay’s three goals were Brad Ginnell, Jakin Smallwood and Connor McClennon who managed one goal per period for the ICE. Stopping 13 shots, Boston Bilous nabbed his second win a Raiders uniform. A tight game between the Kamloops Blazers and Victoria Royals saw the Blazers just barely on the winning side of the game, taking it 3-2 in a shootout. Kamloops captain Jermaine Loewen (Dallas Stars) scored first with a perfect shot into the top corner of the net. Next, it was Victoria’s Scott Walford (Montreal Canadiens) and Ralph Jarratt who scored for the Royals with a wicked wrist shot and a blue-line bomber; respectively. Although it was looking like it would go the Royals’ way, Loewen poked his second of the game home with 45 seconds left in regulation to advance to overtime. With both teams pouring on the gas, neither could score, leading to a shootout. In three quick rounds, the Blazers’ were able to clean up the game, thanks to two spectacular shootout goals by Connor Zary and Zane Franklin. Claiming his second win of the weekend, Dylan Ferguson (Vegas Golden Knights) saved 33 of 35 shots. 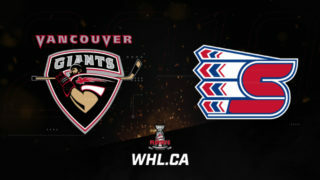 2019 NHL Draft prospect Bowen Byram wired his 17th goal of the season into the net from a tough angle with six minutes to go in regulation, lifting the Vancouver Giants to a 2-1 win against the Kelowna Rockets Saturday. A long-range shot from Dallas Hines put the Giants ahead 1-0 3:14 into the first, but 2019 NHL Draft prospect Nolan Foote responded with his 25th of the season just 15 seconds into the second. The teams remained in a dead heat until the late stages of the third when Byram’s goal broke the deadlock. Saturday’s goaltending battle featured a pair of 2019 NHL Draft prospects in Trent Miner for the Giants and Roman Basran for the Rockets. Miner would claim the win, stopping 18 of 19 shots and picking up a secondary assist on Byram’s game-winning goal. Basran still put forth a strong effort, stopping 37 of 39 shots for Kelowna. While the Portland Winterhawks managed to escape overtime with a win 3-2, the last twenty seconds of their game was cause for concern with the Seattle Thunderbirds scoring twice within 18 seconds of each other, tying the game. Commanding the game, Lane Gilliss buried the puck for the first Portland Winterhawks goals and Robbie Fromm-Delorme took advantage of a great two-on-one rush for Portland’s second goal. Just when the Winterhawks though they had the game sealed, Seattle’s Simon Kubicek and Matthew Wedman tied the game and headed into overtime. Two minutes into overtime, the Winterhawks were awarded a penalty shot to which Seth Jarvis expertly scored on, winning the game for Portland. Stopping 21 of 23 shots, Joel Hofer (St. Louis Blues) aided in the Winterhawks win. Zack Andrusiak had a hat trick and four points as the Everett Silvertips erupted for a season-high total in a 9-1 victory against the Lethbridge Hurricanes Saturday. Bryce Kindopp added a pair of goals as part of a three-point night while a three-point game from captain Connor Dewar (Minnesota Wild) saw him score once while adding a pair of assists. Jake Christiansen added three assists in the lopsided victory. 2019 NHL Draft prospect Gianni Fairbrother also got in on the action, adding a goal and an assist. Artyom Minulin and Reece Vitelli also scored in the victory. Leading 2-0 after 20 minutes, the Silvertips set a franchise record with six goals in the second period, scoring once more in the third. 2019 NHL Draft prospect Dustin Wolf was strong once again in net for Everett, posting 25 saves on 26 shots. Justin Hall had the lone goal for the Hurricanes. Beck Warm allowed one goal on 19 shots in the first period, then shut the door the rest of the way as the Tri-City Americans downed the Spokane Chiefs by a 3-1 score Saturday night at home. 2019 NHL Draft prospect Adam Beckman opened the scoring with the only goal of the first period, but goals from 2019 NHL Draft prospect Sasha Mutala and teammate Riley Sawchuk got the Americans on the board and in front heading to the third. With Warm keeping the Chiefs off the scoresheet in the third, Kyle Olson (Anaheim Ducks) added an insurance goal for his 15th of the season. Olson’s goal gave him a multi-point night after picking up an assist on Mutala’s goal. Bailey Brkin stopped 28 shots in the loss. Chiefs co-captain Jaret Anderson-Dolan (Los Angeles Kings) snapped a two-game pointless streak with an assist on Beckman’s goal.